It was their first European tour. They had tried to tour Europe several times, as Nils after the concert told me, but everytime it had failed because of finances and/or other practical matters. The audience was wild. To my remark that Europe had too long been Sleepytime-deprived, Nils answered that Sleepytime had too long been Europe-deprived. They played the jazz-club Bimhuis in Amsterdam, famous amongst jazz musicians, and a beautiful venue. It is new, has very high ceilings, and largely has a look of wood, metal and glass. All windows are from ground to ceiling and provide magnificent view over the city and the water called IJ. The hall itself is hanging in the air, about ten of twenty metres above the ground, and behind the stage was a large glass wall overlooking the trains and the city. Curtains were closed just before the concert started. 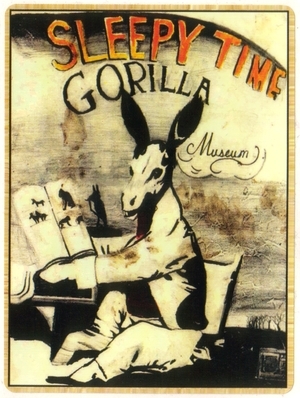 An announcement for a Sleepytime Gorilla Museum concert in 2006. We were early and the band was late, so when we got there they were still doing their soundcheck. We were watching them through windows in the doors. At around eight o'clock they were ready and left the stage, and about half an hour later the doors to the hall opened. Just enough time for them to go get their dresses and make-up backstage, I guess. The hall was beautiful, all seated, in a theatre-shape (semi-circles of chairs, each row further from the stage also higher than the row before it), and the sound was great. Overwhelming even, just as clear in their thunderous moments (as clear as thunder gets...) as in their more atmospherical moments. Almost all the seats were taken, around 300 people I'd guess. I have only known them for about half a year now, and this was my first time to ever see them live. All five of them play a wide array of factory-built or hand-built instruments or something in between, but generally there's Nils Frykdahl on guitars, Carla Kihlstedt on violin and some sort of guitar on a horizontal stand (which she plays using drum-sticks), Dan Rathbun on bass and also a giant bass on a horizontal stand, Matthias Bossi on drums and xylophone, and Michael Mellender on guitar and percussion. There was no opening act. They opened their set with The Companions, and at least also played Helpless Corpses Enactment, Puppet Show, The Salt Crown, Donkey, Sleep Is Wrong (during the song they stood behind their microphones snoring for a while), Ambugaton, Phthisis, Powerless and 1997. I think 1997 was their encore. I have listened to a number of live-recordings from this year, but there were two or three songs that I didn't recognize at all. Their new album, In Glorious Times, will be released in six weeks time. Nils confirmed our suggestion that because it was their first tour here they played more old songs than they did in America. The Donkey-Headed Adversary Of Humanity Opens The Book. Nils told the audience how he liked the idea of us Dutch all biking, and how that could be a convenient ways of transportation in a city. And he made some remarks about the Dutch language, which I think came down to how bewildered he was by it. 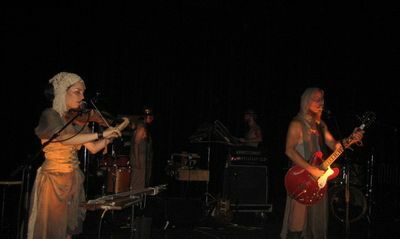 At one point during the set, Carla turned away from the rest of the band, improvising some strange sound on her violin. The other band members stood watching her amazed and meanwhile continued to play as well as they could, only to find that behind their back their drummer too was going in his own direction, with his back turned in the direction of the others and playing some strange rhythm. Dan pulled the chord of the electrical violin to try and pull Carla back into the band, and then the whole song fell silent. "Must be something with all those free-jazz-improvisation-vibes that are everywhere in this hall," Nils remarked drily. And the song continued. Sleepytime Gorilla Museum in het Bimhuis op 18 oktober 2007 (unknown photographer). During one of their last songs (was it Ambugaton?) someone from the audience stood near the stage and was head-banging, showing everyone his very long hair. Around eighty percent of the audience by the way was men between twenty and forty years of age. Nils told us that they had hardly ever played in front of a sitting audience before, but both Nils and Carla added that it was by far the most energetic and energizing of all sitting audiences they had ever witnessed, something they had not expected. There indeed were shouts, screams, sitting headbangers and rapturous standing ovations (not only by me). After the show had ended we remained in our seats and got to chat with Nils, Carla and Matthias. We left at one o'clock, and got home by half past three. 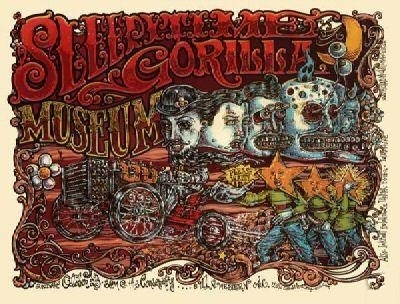 I've done nothing since but sit in my In Glorious Times T-shirt and play their music.